Hey, look at this phone, I say to my girlfriend. That's not a phone. That's a tablet, she says. Exactly. No, really, what is it? The Samsung Galaxy Mega bills itself as a smartphone, despite its 6.3-inch screen. That puts it closer in size—by a good margin—to a Nexus 7 tablet than Samsung's Galaxy S4 (which itself has a pretty damn big 5-inch screen). Is it a phone? You could argue that it's a phone if it's a device that's primarily used for voice communications. But who could even say that of their smartphones right now? Most people I know barely use their allotted voice minutes. Phones are already just portable texting/emailing/Facebooking/websurfing/app-using devices already. So just what the everlasting Android does phone even mean anymore? I don't know. 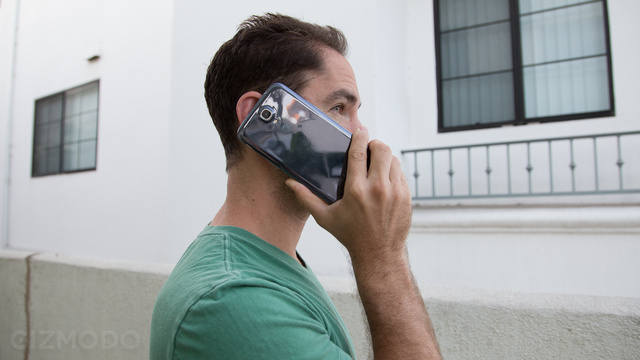 It's useless, but maybe it at least keeps us from having to say phablet with a straight face. This new communication device from Samsung has a 6.3-inch 720p screen (233 PPI). It launches with Android 4.2.2 with Samsung's very heavy TouchWiz UI on top of it. It runs on Qualcomm's lower-end dual-core Snapdragon 400, clocked at 1.7, has 1.5GB of RAM, an 8MP camera, and it runs on AT&T's LTE network. In other words, it's a mid-range device with a gigantic screen. Shaquille O'Neal. People with very bad vision. People who essentially want a small tablet that they can occasionally make phone calls on. It's gigantic. The device is 6.60 inches tall by 3.46 inches wide. It's surprisingly thin given its other dimensions, at 0.31 inches, but it's definitely a two-hander. I have decently large hands and trying to use this device one-handed resulted in extreme frustration. 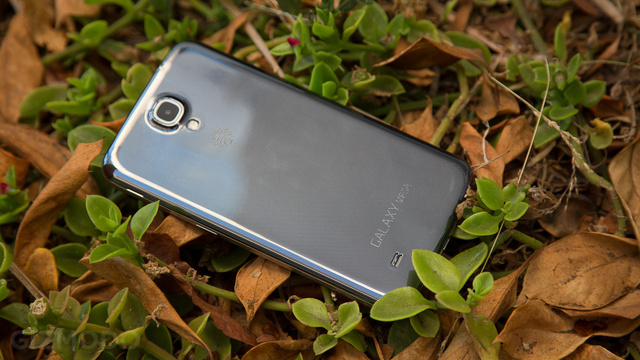 It's also got that same plastic back common among all Samsung phones that we've never particularly cared for. On the back is a little hump for the 8MP camera. Up front is Samsung's standard mechanical home button, and capacitive buttons for Back and Menu. Android doesn't need these anymore, and we wish manufacturers would just get on board with that already. Making a phone call on the Mega makes you look and feel like a complete idiot. It covers almost your entire face. Using it as a camera is downright dangerous, because one-handing this device is a recipe for droppage. Even texting on it is laborious because they keyboard is so spread out. All that said, reading websites on that screen is fantastic. TouchWiz is just as frustrating as ever, but not any more so here than on other Samsung handsets. Except for how slow it is. My goodness, is it slow. Battery life is really, really good. You'd think that the giant screen would basically eat up all of that 3,200mAh battery's juice in an instant, but it doesn't. I never once had to charge it during the day with medium-heavy usage. With very light usage I stretched it to two days. That's damned impressive. 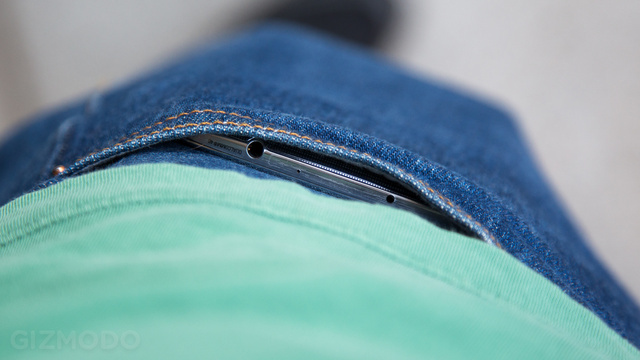 Let's sidestep the obvious about how it's too big to fit into a normal pants pocket (those jeans you see above are normal Levi's 501s, not some hipster skinny-jeans, by the way) and that every time you bend down to pick something up you're sure the screen is going to shatter and impale a million glass fragments into your thigh. The tragic flaw with this phone is that it positively lumbers through anything you want it to do. 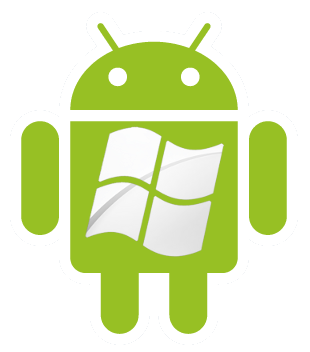 Want to open an app? Tap it. Then wait five seconds for it to open. Same thing for going back to the home screen. If you accidentally tapped the wrong icon, it would take you a full 15 seconds plus to get out of it and into the one you wanted. The camera launches slowly, there's lag and jutter on the homescreens, and even relatively simple games (like Slingshot Racing) play all herky-jerky. It's as though because the phone itself is a giant its guts feel compelled to lumber along like one as well. 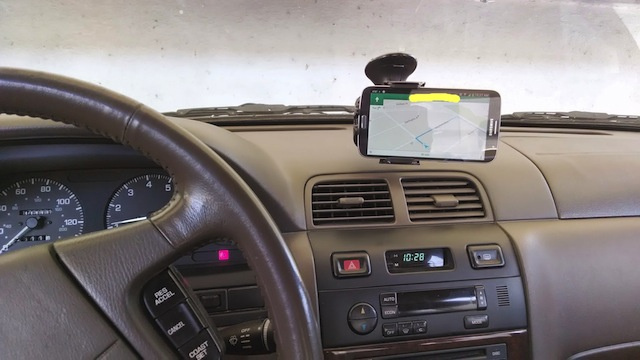 First, this phone is almost too big for this dashboard mount which Samsung itself makes, but you can squeeze it in there, and then it's really easy to read turn by turn directions... until you put some polarized glasses on. The the screen turns black. Rotate the phone a quarter turn (so it's vertical), and the screen reappears. The magic of polarization! This isn't unique to this phone—others have screens that work the same way—but it's more of a problem for the Mega because you can't have it vertically mounted on your dashboard. It won't fit on most cars, and even if it did, it would take up too much of the window. When I tested the Galaxy Note II, with its 5.5-inch screen, strangers would come up to me and say, "Holy crap, that's big! What is that? That's way too big!" Do you know how many people said, "Oh, that would be so much better if it were, like, almost an inch bigger." Zero. Zero people said that. 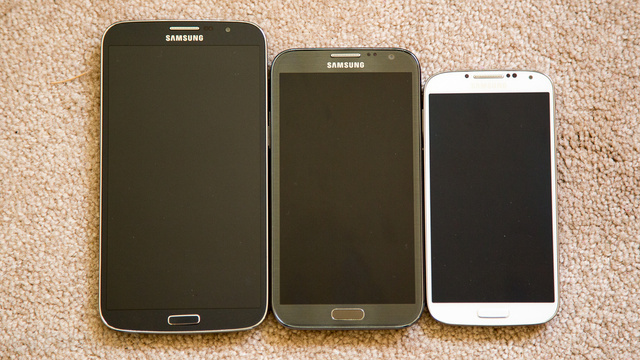 Above you see it next to the Note II and the Galaxy S4. 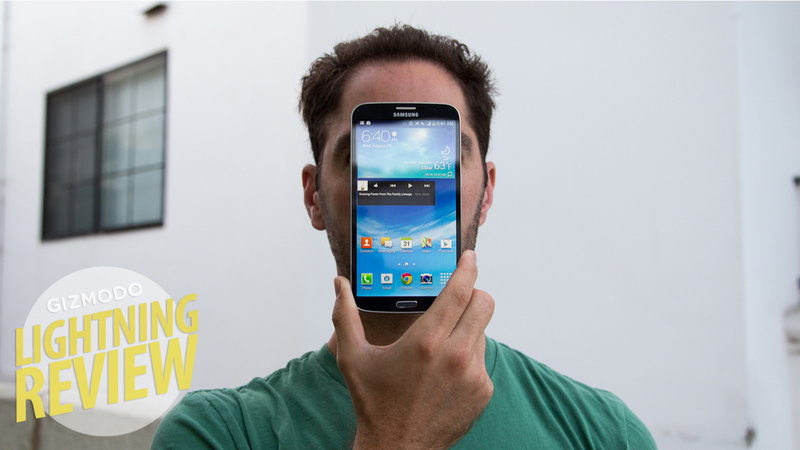 It doesn't look that big until we remind you that the Galaxy S4 is already very large. It's like how LeBron James isn't that tall, when he's standing next to Manute Bol. Breaking tradition, Samsung put very loud speakers on this phone. You definitely won't miss a call, and turn-by-turn directions are certainly easy to hear, even with the windows rolled down on the highway. Another broken tradition: Samsung went with the TFT-LCD screen rather than the AMOLED screens it typically put on its Galaxy line. The screen is fine. There's certainly not much visible pixelation, but it's not as vibrant and the blacks aren't nearly as deep as they are on the Galaxy S4. 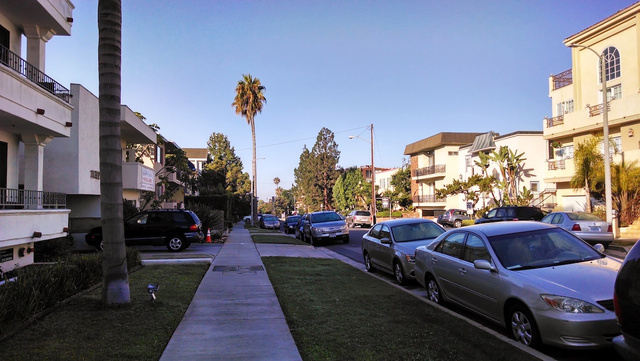 The camera is decently sharp but it really struggles with dynamic range. Details are constantly lost in the shadows. It was also typically way off in color temperature. And again, it's really awkward to take pictures with this thing. That would be one big, unequivocal no. It's not good at being a phone, and it's not good at being a tablet. It is, in short, not good. If you're really into big phones and need something right now, go for the Galaxy Note II, which is plenty big and actually is a good phone. Or, better yet, wait just a few more weeks when we expect the Galaxy Note III to be announced, which will probably be even better, and smaller (but still huge).